Smith & Wesson's Sigma Series Allied Forces SW9VE goes on duty in Afghanistan. Back in 1994 Smith & Wesson launched the Sigma series of semiauto pistols. Initially introduced for the new .40 Smith & Wesson cartridge, the gun found favor in the law enforcement and self-defense markets and was soon also chambered for the 9mm Luger. The author found the Sigma to be more than adequate for home defense or law enforcement needs. There is no doubt that the Sigma was made to compete with Glock. This polymer pistol from Austria was taking the handgun world by storm and continues that advance today. Not to be outdone, Smith & Wesson brought out the Sigma and today--after a few changes here and there--it is still a popular gun with law enforcement both here and abroad. Just recently, the Sigma SW9VE was brought on line as an Allied Forces Model SW9VE, with the Afghanistan National Army, National Police and the Border Patrol placing initial and follow-up orders for more than 22,000 of the 9mm-chambered pistols. This gives us an opportunity to do a quick review of the Sigma, which is one of the more moderately priced handguns in the self/ home-defense category from a well-known name in the industry. The gun is rather boxy and certainly not as handsome as other 9mm handguns such as the Smith & Wesson Model 952. But then again, a person buying this gun is probably looking for firepower and dependability. And in those categories the Sigma has certainly stayed the course of the last 13 years. The slide is square right up to the muzzle, where it runs parallel to a frame that houses a molded-in equipment rail for accessories such as a laser sight or flashlight. This slide is made for durability, as it features a through-hardened stainless steel slide and a four-inch barrel. On top of all this it is finished with a matte Melonite finish that is more than adequate for any weather or combat situation you might care to throw at it. Moving back, you'll notice a convenient loaded-chamber indicator located at the rear of the barrel. Under stressed conditions, one downward glance assures the operator that he can confidently move forward knowing that the gun is fully loaded and ready to go. There is a ramped front sight with a white-dot insert and a dovetailed rear sight that is adjustable for windage, which has a white dot spanning each side of the well-defined notch. (Left) The Sigma mechanism uses the barrel-tip design used on most semiautomatic guns using full-house centerfire ammunition. (Center) The trigger has a smooth surface and is articulated in the center, which is much different than that of the competition. (Right) The grips have a modified arched housing, which keeps the gun pointed in a more natural direction. This gun is made for both right- and left-handed shooters. Notice the fine-line checkering and the large magazine bumper. Operator controls consist of a slide lock and magazine release on the left side of the polymer frame. The slide lock is large enough that you do not have to turn the gun to the left to release the slide. Just by using the ball of the thumb, the slide can be released to go forward with hardly any effort. The magazine release is large enough to be activated with gloves, and pushing it inward drops the magazine without hesitation. If there is a loading failure or malfunction, the baseplate has enough area in which to grab it and pull it out of the gun. The one thing that you will notice right away is the nice feel the gun has when you pick it up and use it. Due in part to the 18-degree grip angle, a small arched bulge at the rear of the grip and the handsome checkering, the gun is extremely comfortable to hold and shoot. (Left) An integral equipment rail is designed to fit many different aftermarket laser sights or lights. (Right) At 10 yards the gun is more than accurate enough for the job for which it was intended. Here is the best group of the morning, with Hornady's 115-grain FMJ loading. Several five-shot groups averaged around two inches. The Sigmas are double-action only but do not have a pivoting safety lever on the trigger as does the Glock. Instead, Smith & Wesson uses an articulated trigger to accomplish the full ignition cycle. The trigger will not move unless this lower portion is moved in concert with the upper part. Combined with internal levers and springs, this makes the gun easy to shoot while being safe at rest or in a holster. Sigma pistols are being offered by Smith & Wesson in a number of interesting kits, to include disaster, knife and light versions. While the Glock uses a striker that remains in the half-cocked position, the Sigma uses a mechanism that moves the striker from rest to a full rearward position and then releases it to fire the gun. As the gun is fired, the spent case is ejected, the slide goes forward and the process starts all over again. Being double action, the gun has a rather heavy trigger pull, and my test gun registered almost 10 pounds out of the box with more than a half-inch of slack before the sear broke. 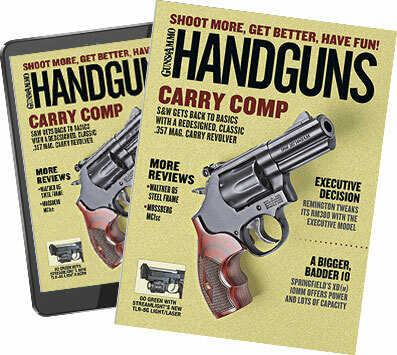 Much of the popularity of a handgun like this is its low maintenance, and taking the gun apart is easy and straightforward. The gun comes packaged in a sturdy plastic case with two additional magazines, and for those with specialized needs the Sigma can be purchased in Disaster, Combat Light or Tactical knife kits.